The Sippican Lands Trust (SLT) will host its Annual Meeting on Wednesday, June 27 at 5:30 p.m. at Kate’s Simple Eats, 148 Front Street, Marion. All people are welcome and encouraged to attend SLT’s Annual Meeting to learn more about the work of Sippican Lands Trust and its land conservation work in Marion. 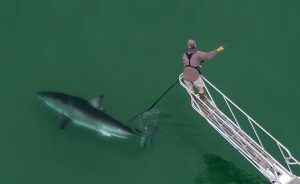 Dr. Greg Skomal, world-renowned shark expert and SLT board member, will give special presentation titled “Seeing Deeper into the World of the Great White Shark.” Dr. Skomal currently heads up the Massachusetts Shark Research Program (MSRP) at the Division of Marine Fisheries in Massachusetts. Dr. Skomal serves as an adjunct faculty member at the University of Massachusetts School for Marine Science and Technology in New Bedford, MA, a guest investigator at the Woods Hole Oceanographic Institution in Woods Hole, MA, and an adjunct scientist with the Center for Shark Research in Sarasota, FL. Dr. Skomal has a master’s degree from the University of Rhode Island and a PhD from Boston University. Kate’s Simple Eats is located at 148 Front Street in Marion. Parking is available and guests are welcome. Light refreshments will be served, and a brief business meeting will be conducted prior to the presentation. For more information contact Sippican Lands Trust at 508-748-3080 or info@sippicanlandstrust.org.